“ZZZzzz” was the odd sound of pulleys racing and then gliding across cables. Yesterday some sista-friends and I went zip lining. It was both a bit frightening and exhilarating. Among my group, I was the only one who had previously gone on such an adventure. It was not nearly as scary as my first time zipping. As I reflected on my added confidence, I understood how this same idea should apply to other aspects of my life. Far too frequently, we find ourselves in a rut of doubt and disbelief. It may seem as if we cannot manage a new challenge. In my own life, I have found myself on such an emotional plateau. It feels difficult to move or know which way to turn. Often one has a “gut feeling” or intuition that will suggest an idea that seems so out of the norm we doubt the clarity from which it came. It takes a bit of daring to strike out on a new course. The temptation is high to dissuade yourself or have another do it for you. In the case of this zip lining trip, a new location could have presented unexpected challenges. Yet, as with life, I recognized that many of the challenges we face or mentally create are reminiscent of a past obstacle. There is no need for real alarm since you have overcome such an issue before. Generally when we reflect on how we rose above the situation, we will note we took a radical approach to create a better outcome. If one just has the courage to take the leap, the outcome will usually positively exceed our expectations. Here are some steps from zipping we can universally apply to various aspects of our lives. 1. Take only what you need. We were suited in safety equipment which left little room for cumbersome objects. Equate this to shedding excess baggage or burdens to be prepared to take it to the next level. 2. Have a clear goal. While preparing to zip, I imagined myself at the next platform and directed my energies toward it. I did not allow myself to become sidetracked over the “what ifs” that could have arisen. 3. Focus your energies on the outcome you desire. In my mind, I saw myself successfully reaching each new platform without getting stuck. If we take more time to think on what we want instead of what could go wrong, we can enjoy more success. 4. Take the leap. Nothing new or better will ever come if you always remain stagnant. Leaping and reaching a new level is thrilling. The sheer momentum will assist you in other upward gains. Also, keep in mind to leap and not quite make it to the goal is still forward progress. One of the ladies did not quite make the platform in the one of the zips. She remained calm and quickly saw assistance was ready to help her reach the goal. Everyone finished the course with a feeling of empowerment; no one failed to find success. Similarly, the universe wants you to be successful. If you take the big step, forces will rally you to the end goal. Remember everything is working toward your greater good. 5. Remember you have support. My fellow adventurers and I discovered that each small claw of our rigging supported 5,000 pounds. We had two guides and a host of harnesses. There was no need to worry about being hurt or failing. Tools, resources, and aid, all above what one might actually use, was all around and willing to reach out to assure our success. 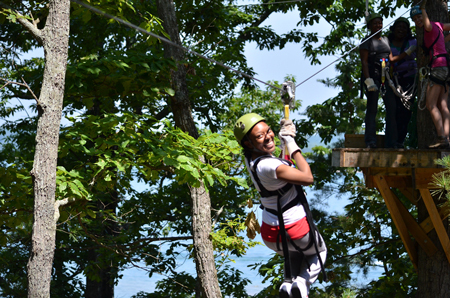 There were several mini-lessons embedded into my zip line experience. A funny thing I discovered was I did not have to plunge or propel myself to gain momentum to zip. I merely positioned myself in a comfortable position and lifted my feet. Gravity did the rest. Change does not have to be uncomfortable; it can simply be a shift in conscious direction. There were times we were allowed to zip without breaking, much like the times when we should give our efforts our all. As well, when I needed to slow down, there were signals to indicate it was appropriate to change the pace. Breaking was a created by calm, evenly applied pressure. –Nothing about zipping was erratic, just calculated forward motions. My advice is to be as a “zipper.” Take the leap, overcome your doubts and fears, and move to the next level of your prosperity.